Avionics systems software and hardware upgrades can provide 21st century communications between pilots and Air Traffic Controllers like never before. Those same upgrades can also allow airspace users to fly more efficient flight paths with greater situational awareness than has ever been available in the global air transportation industry. Civil aviation authorities are starting deployment of next generation air traffic computer technology in the form of the NextGen project in the United States and the Single European Sky in Europe. These advances have the ability to interact directly with aircraft Flight Management Systems (FMS) and flight crews with data link digital communications. Modernization from Airspace Navigation Service Providers (ANSP) such as the FAA and EASA, has brought about mandates for avionics equipage by airspace users. Among those mandates, Future Air Navigation System (FANS) 1/A, Controller-Pilot Data-Link Communications (CPDLC) and Automatic Dependent Surveillance-Broadcast (ADS-B) Out are the three most prevalent in the near term. By examining all of the requirements for the mandates in the airspace they fly in, operators can ensure that they're equipping their aircraft at a rate that will enable them to either simply comply or continue to use their aircraft for different mission profiles over the next 10 to 15 years. Once these mandates become effective and ANSPs have deployed all of their accompanying ATM modifications, text-messaging-type communications between pilots and controllers will help reduce voice channel congestion and confusion. With all of the new aircraft systems technology available, it is important for operators to remember that the best approach toward keeping their aircraft adaptable to future Air Traffic Management (ATM) upgrades is using an FMS-centered approach, according to Steve Hollington, marketing leader of go-to market at Honeywell Aerospace. Making sure that new solutions are well interfaced with the FMS will ensure that, over the life cycle of the aircraft, a software upgrade to the FMS versus another new fleet-wide hardware swap could guarantee that aircraft are compliant with future mandates and save money on equipage and installation fees. "We have, quite frankly, most of the Flight Management Systems onboard most business aircraft. We have taken great pains on our side at a pretty significant expense to make sure that our Flight Management System is upgradable to interface with the different hardware upgrades." Future Air Navigation System (FANS) is an aircraft communications capability that was first developed by the International Civil Aviation Organization (ICAO) in collaboration with Airbus, Boeing, Honeywell and several other aerospace companies to enable the flow of more aircraft within a given airspace. The technology allows text messaging between Air Traffic Controllers (ATCs) and pilots along with Automatic Dependent Surveillance-Contract (ADS-C) long-range position reporting. When it was first developed, Boeing called their solution FANS 1 and Airbus called their solution FANS A (for Airbus); FANS 1/A is a combination both. Designed for use in remote areas not served by radar FANS 1/A is text messaging and position reporting via satellite communications where the pilot interface is typically through the Multipurpose Control Display Unit (MCDU). Before satellite communications (satcom), Very High Frequency (VHF) was the only mean for long-range communications available, which is still used today. The issues for long-range communications, however, are poor voice quality and difficulty in sending datalink messages, which in some cases lead to unknowns in aircraft position, etc. These have been circumvented by adding satcom to the aircraft for both voice and data. "The genesis of FANS was that in the bad old days, when aircraft were flying over the Atlantic or any large oceanic body of water for that matter, they were out of communication with each other and with ATCs. The only communication that airplanes used to have was VHF, which has a range of plus or minus 100 miles," said Hollington. "The way that was managed was by big separation. FANS was facilitated by new communications methodology enabled primarily by satcom, which basically allow aircraft to be in touch with ATC via satcom and to be in touch with each other via ADS-C."
That leap in aircraft communication capability has lead to several mandates, with the most near term one falling in the ICAO North Atlantic Track (NAT) region, which is most commonly used by business and air transport aircraft flying between Europe and the United States. Aircraft flying in the NATS region between FL 360 and FL 390, which are the two most optimum flight profiles that feature the shortest routing distances between the East coast of the United States and Europe must be FANS-equipped. FANS relies on digital Communication and Navigation Systems (CNS), which feature Global Positioning Systems (GPS) and improved surveillance. Enhancing communication, navigation and surveillance equipment allows authorities to safely reduce separation distances, allowing aircraft to fly at their most favorable altitude and consume less fuel. American Airlines provides a great example of a carrier that uses the NATS region extensively and recently completed a mid-life avionics retrofit program on its 757 and 767 fleets that included the installation of Multi-Mode Receivers (MMR), Communication Management Units (CMU), VHF Data Radios (VDR), Flat Panel Cockpit Display Systems, Multipurpose Control Display Units (MCDU), and upgrades to the Flight Management Computers (FMC). The FANS equipage enabled them to begin using Controller-Pilot Datalink Communications (CPDLC) over the oceanic airspace. "On our wide body international fleet we use data communications. Those aircraft are FANS equipped, so we have CPDLC, which is both beneficial and safe, when we’re en route and out of VHF radio range with air traffic control. CPDLC is significantly better than HF voice communications, especially when paired with satcom voice capability. It’s the way of the future and will benefit both flight crews and controllers," said Brian Will, director of airspace optimization and aircraft technical at American Airlines. While American is ready for the looming Feb. 5, 2015 deadline, according to Greg Francois, decision makers have a few options open to them when looking to comply with the NATS FANS equipage mandate. For example, operators of Airbus and Boeing passenger jets have the option of using either Service Bulletins (SB) from the Original Equipment Manufacturer (OEM) — which can be more costly — or obtaining a Supplemental Type Certificate (STC) for the solution that they feel will best help them comply with the mandate. "In a lot of cases the service bulletins from the OEMs will be more expensive than an STC, but in a lot of cases, you’ll need the OEM involvement no matter what. So in some cases it can be more expensive to go with the OEM SB, than it would be to just get an STC to comply with the equipment. From Honeywell’s standpoint we look at both options, so we refer the customers to both the Boeing and Airbus aftermarket teams for an SB support or if they want to go down the STC path, we’ll help support them and get them the STC," said Francois. "All the 757s, 767s and the other transcontinental aircraft that have not upgraded yet to FANS will need to equip. That’s another big equipage that they’re working on to get the FANS 1/A equipage completed as soon as they can when the whole NATS is going to require that in 2015." 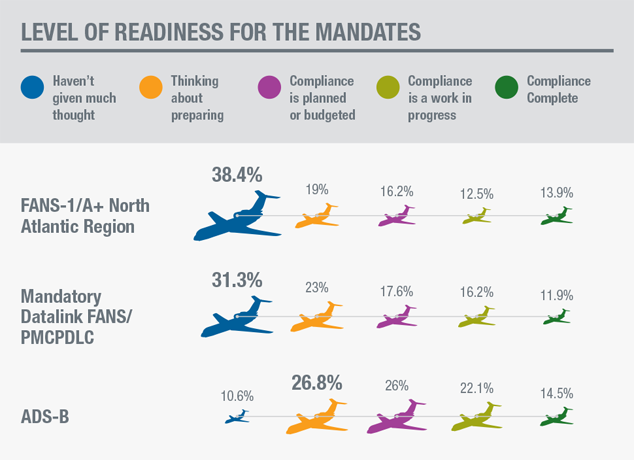 This analysis is based on a blind online survey conducted with Aviation International News to gauge awareness and readiness for impending international aviation regulatory mandates. Results are tallied from 365 respondents, including operators, pilots, airlines, and corporate flight departments, who participated in the April 2014 survey. More info available at aerospace.honeywell.com/mandates. Protected Mode Controller-Pilot Data-Link Communications (PM-CPDLC) is an air/ground data-link application that enables direct text messaging communications for revised clearances and rerouting instructions between the aircraft FMS and Air Traffic Controllers. Airspace users flying in European airspace above 28,500 feet will be required to be equipped with PM-CPDLC by Feb. 5, 2015. The European Aviation Safety Agency (EASA) has had a head start; for several years now, it has mandated CPDLC equipage for forward-fit aircraft coming off the production line. CPDLC avionics enable text-based communications between the aircraft flight deck and ATC. This digital communication capability helps to reduce on-the-ground delays by enabling ATC clearances for flight levels and altitudes and lateral deviations as well as pilot requests for deviations, information and the occurrence of emergencies. The technology was originally developed in Europe and first put to use by the Maastricht Upper Area Control Center (MUAC) in 2003. It uses the Aircraft Communications and Addressing Reporting System (ACARS) software with VHF Data Link Mode 2 (VDL Mode 2/VDLM2) to provide a block of approximately 160 pre-defined text messages. Whereas ADS-B Out is essentially the underlying root transformative ATM technological modernization under the rollout of NextGen in the United States, CPDLC is the baseline technology of the implementation of the Single European Sky ATM Research project, according to Jens Ritter, head of flight operations and fuel efficiency at Lufthansa. Presently, the airline and several other carriers are part of the SESAR team evaluating the readiness of CPDLC for operational usage. "Currently, the European Commission is preparing the SESAR deployment process which closes the loop of the project's definition-development-deployment lifecycle and allows SESAR to fully deliver its benefits from concept to implementation," said Ritter. "The main task of SESAR deployment involves the synchronized rollout of developed technologies, such as pilot Datalink communications between all stakeholders in the Air Traffic Management (ATM) value chain. The operational usage of the mentioned datalink communications depends on the readiness of both, airline and air navigation service provider." 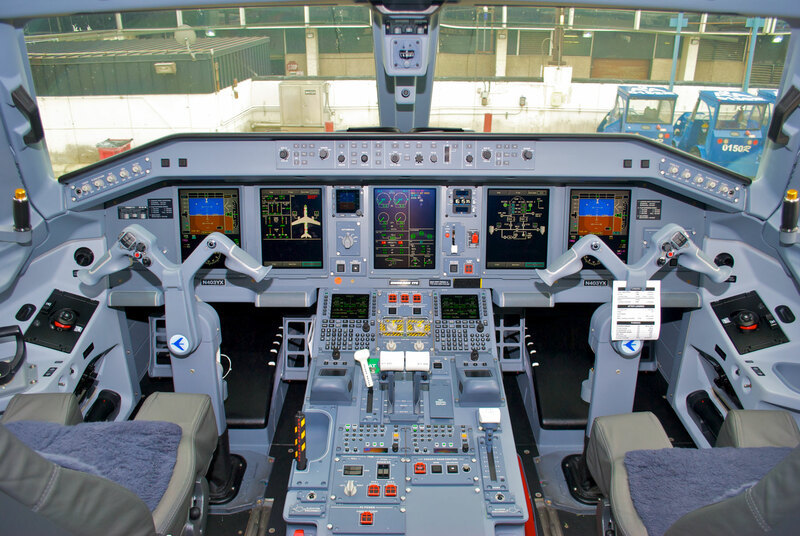 Operators that are considering retrofits to comply with the impending CPDLC mandate in Europe should consider the projected future usage and mission profile of their aircraft fleet. Honeywell provides integrated avionics solutions to ensure compliance today and into the future, allowing you to fly anywhere, anytime. Automatic Dependent Surveillance Broadcast Out (ADS-B Out) is a technology that communicates the exact position of an aircraft to other aircraft and air traffic control. Essentially, ADS-B is a new air traffic surveillance system that will replace legacy ground-based radar systems that civil aviation authorities have been using to manage air traffic for several decades. To comply with the most stringent airspace mandates aircraft need to be equipped with a 1090 Mode S DO-260-B transponder, a certified Wide Area Augmentation System Global Positioning System (WAAS GPS), along with an interfacing mechanism such as a modern radio tuning unit. ADS-B Out equipage to comply with future mandates established by the FAA and EASA is one of the most discussed topics across air transport, business aviation and the general aviation sectors of the global aviation industry. It defines the transmission of the position and aircraft information from the cockpit to ground-based radio stations and other aircraft. The technology allows ATCs to track aircraft with greater accuracy than they've ever been able too, providing an update of aircraft position every second versus every 12-seconds on legacy radar-based systems. While the FAA is requiring all airspace users to be equipped with certified ADS-B Out solutions by Jan. 1, 2020, Europe has recently delayed its established ADS-B Out mandate. The European Commission recently changed the mandate for new production aircraft to be equipped with ADS-B to DO-260B by June 8, 2016, and the retrofit date has been moved to June 7, 2020. "DO-260B is the highest level of ADS-B Out transmission available," said Marjan Jozic, chairman of the Avionics Maintenance Committee (AMC). "Airspace users that are flying in both the U.S. and Europe need to make sure they equip with a DO-260B solution, so that they don't make that investment and then find out later that its not in compliance." Despite the delay in the mandate in Europe, Jozic believes some operators may find themselves scrambling to comply at the last minute, due to the down time needed to deploy ADS-B Out boxes across their fleet of aircraft. "A lot of them will decide to do this during the C-level maintenance check. But if you look at it, those C-level checks are usually on 25 to 30 month schedules. So if you combine that with how many aircraft still need that upgrade, you could get a situation where there's not enough personnel to equip them in time." Honeywell agrees with Jozic's position, as Francois indicates that, in order to get all the aircraft flying in European airspace compliant by the new 2019 deadline, "you have to start basically three to four years in advance of a mandate deadline to make sure you can get all the aircraft through that cycle and they can all be retrofitted in time to meet the mandate." "It’s a lot of aircraft to do in a relatively short period of time. The airlines are not moving out quickly — we are advising the airlines to move early on that equipage but the reality is that’s not happening." These retrofits are mandated in order to accommodate for the projected growth in air traffic, which is forecasted to double in both the United States and Europe over the next two decades. FANS, CPDLC and ADS-B Out equipage will ensure that all aircraft are flying fuel efficient, optimal flight paths and giving ATCs the ability to track them and digitally communicate directly with the aircraft rather than relying on the legacy radar-based voice communications system. "We’re finding an increasing number of questions about FANS and CPDLC and, again, just the way of how best to manage this depends on what the operator wants to do with the aircraft as far as mission profile and how its currently equipped. But the big trend is, there seems to be a lot more questions and a lot of unsure operators out there which is exactly when we put this mandates website together. In addition to our commitment to safety, we believe that we have the opportunity to be an educational resource through the aviation community and that’s a role that we take very seriously," said Hollington.